In the last 150 years, the coastal scrub vegetation in the Baldwin Hills has decreased substantially, from ranching, oil drilling, urbanization, and introduction of exotic and invasive plant species. 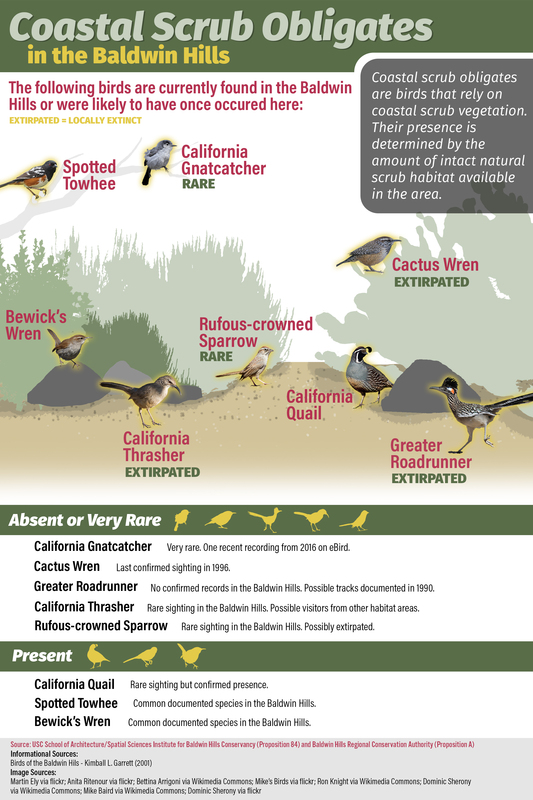 Many birds in the Los Angeles basin rely on scrub-type habitats for foraging and nesting and its loss can lead to the local extinction of some of these species. 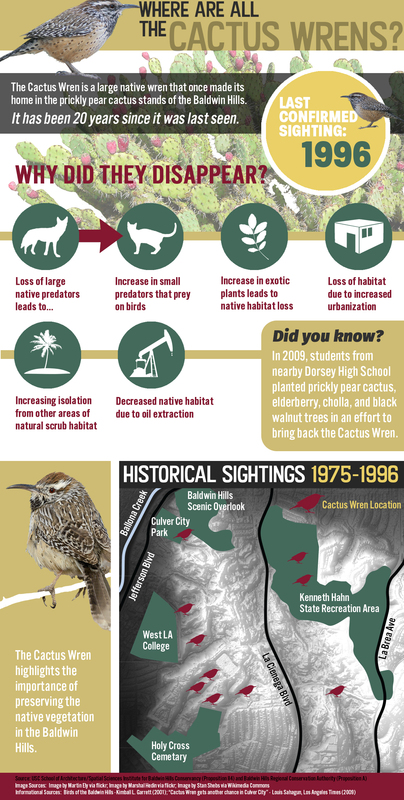 The apparent loss of the Cactus Wren is just one example of the effect that coastal scrub loss has had on the wildlife in the Baldwin Hills. What is coastal scrub vegetation? A number of bird species in Los Angeles are known to rely heavily on this type of vegetation and are referred to as “Coastal Scrub Obligates”. The abundance of these birds in the Baldwin Hills depends on the availability of intact coastal scrub habitat and their presence in the natural environment is a hopeful indicator of the persistence of healthy and intact scrub habitats. A winter migratory bird, the Yellow-rumped Warbler, is a common visitor to the Baldwin Hills. Most easily spotted by the yellow spot on its rump (and the reason for its name), this bird has been observed in Kenneth Hahn, the Baldwin Hills Scenic Overlook, Culver City Park, and West LA College according to eBird. Two different types of Yellow-rumped Warblers can be found here, the Audubon’s Warbler and the Myrtle Warblers, with the Audubon’s Warbler more commonly found in the Baldwin Hills and identified by its yellow throat. The White-crowned Sparrow is a another common migratory bird that is often seen between September and April. Though it has been spotted in multiple habitat types across the area, this bird typically prefers the scrub environment where there is low brushy shrubs to forage for food. Community observations have been recorded on eBird indicating that this is one of the most commonly spotted birds in the Baldwin Hills Scenic Overlook area and can also be found in Kenneth Hahn, Culver City Park, and West LA College. Look for its black and white striped head bobbing among the scrub. Another common bird found in the native coastal scrub habitat, the Bushtit is a small songbird that you can find flitting around in flocks, foraging for insects amongst the scrub vegetation. Though their markings are not very distinctive, this tan-grey bird can be identified by its round, plump body and unique, hanging sac-like nest. The Bushtit is a known breeder in the Baldwin Hills and has been spotted all throughout the area, even in the urban lowlands. The California Quail is a rare sighting in the Baldwin Hills. Bird surveys in 2000 spotted the bird in Kenneth Hahn State Recreation Area and near West Los Angeles College. Because this species nests on the ground in coastal scrub vegetation, it is vulnerable to predators. When present, its bold markings make this bird easy to identify as it forages on the ground for seeds and leaves in the coastal scrub habitat. Another bird species that prefers coastal scrub habitat, the Bewick’s Wren is a fairly common species to spot in the Baldwin Hills, though you will typically not see this bird in the surrounding urban area. Bewick’s Wrens sing loudly and often pair up monogamously. Surveyors in 2000 estimated there were 40-45 pairs of these birds in the Baldwin Hills. Look for them in coastal scrub patches throughout the area. Like Bewick’s Wren, the Spotted Towhee is another bird that is commonly found in the Baldwin Hills despite its absence from the surrounding urbanized area, indicating the importance of habitat islands like the Baldwin Hills. Often found in or near coastal scrub vegetation, surveyors from 2000 estimated 25 pairs of the Spotted Towhee in this area. This sparrow can be found hopping around leaf litter throughout the area, identifiable from distinctive orange-brown markings and its black head. The Rufous-crowned Sparrow has been spotted in the Baldwin Hills, but it may no longer reside there. Surveyors who spotted the bird in 1999 and 2000 speculated that this species may just be visitors, as no nests were found. These birds typically prefer steep slopes where coastal sage scrub exists, but they can also be found in some disturbed sites in the Baldwin Hills. Bushtit. All About Birds. Cornell Lab of Ornithology. White-crowned Sparrow. All About Birds. Cornell Lab of Ornithology. Yellow-rumped Warbler. All About Birds. Cornell Lab of Ornithology.